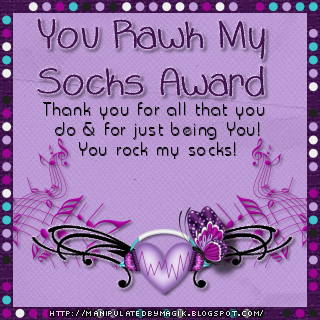 LadyAries' Creations: You Rawk My Socks Award! Hi I'm Rita, most of you know me as LadyAries around the forums and the tagging community. Welcome to my blog. I live in South Carolina and am married to the most wonderful man, my soul mate Wayne. Together we have 4 daughters and 5 wonderful grandchildren. I have been addicted to PSP and tagging for 7 years. I love to bowl, read, scrapbook & watch movies. And I am addicted to Pinterest. Here I will be displaying some of my creations. I hope you enjoy your visit! 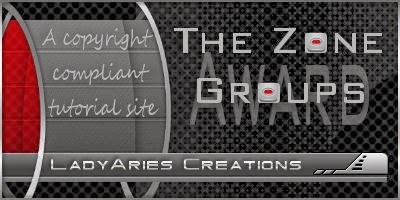 All creations I provide on this blog are my own creation. Any resemblance to others is strictly a coincidence. Anything I share on my blog is for your personal use only. *Do not claim as yours. *Do not change the file names. *Do not alter, re size or add names to my snags & tags. *You are more than welcome to use any of my creations in your group challenges but be sure to add a link back to my blog please. *No money may be gained by the use of anything on this site. *Do not copy and or translate my tutorials and place elsewhere. *All links were current and available at the time of their posting. We cannot control who comes and goes, so if you find a broken link, please use a suitable replacement item. I would love to see anything you make using my creations. Feel free to send them to me and I will gladly showcase them. Thank you and enjoy! You Rawk My Socks Award! Today I received this award from Erica of Brutal Designs. If you have received this award, please place it proudly on your blog, and then pass the award on to 5 people of your choosing!